For those of you who aren't familiar with this book (and it can't be many of you), UNBROKEN tells the amazing story of Louis Zamperini. Zamperini was a former Olympic runner who became an airman during World War II. In 1943, the bomber he was flying on crashed into the Pacific Ocean and only three men survived. What happens to Zamperini after the plane lands in the water is truly incredible! It's a story that proves that real life is definitely stranger than fiction. I fear my opinion of UNBROKEN isn't going to be a popular one. I liked it, but I didn't love it. Without a doubt, I thought Zamperini's story was both fascinating and inspirational; however, I had an extremely difficult time getting into the book. At times, I thought it was very bogged down in details, especially as they pertained to the war and planes. I acknowledge that my taste in books doesn't run towards history or World War II books, so I know that was my personal problem and not a problem with the book. In fact, if anything, I was extremely impressed with how much research Ms. Hillenbrand conducted to write this story. Once Zamperini's plane went down and the book became more of a survival story, I appreciated it much more. I can't even express how much this man went through and his strength and perseverance are truly inspirational. As I read the book, I couldn't imagine going through any of the horrors that this man experienced; and I was continually amazed by how many bad things kept happening to him. And then, I had another issue with the ending. I don't want to give anything away about what happens to Zamperini, but I will say that he has a life-altering transformation -- think redemption. This change is an extremely positive one and I felt as if the author kind of rushed it compared to the pace of the rest of the story. Maybe Zamperini doesn't want everyone to know the details about his personal life, but I was dying for more. How he has managed to lead such a wonderful life after experiencing so many horrific things is something that would be extremely interesting to me. UNBROKEN was a great book club selection for our group. Most of my friends adored it; however, there was one woman who didn't like the book (not the story) all that much. There is a reading guide with discussion questions, but I don't remember actually using it. Some of the topics you might want to discuss include war, strength, faith, heroes, bullying, human nature, and redemption. My group was lucky enough to have a member whose grandfather was an airman in the same type of plane that Zamperini was in when he crashed. 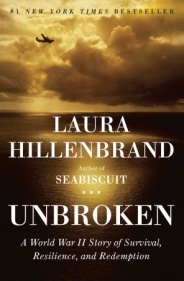 Reading UNBROKEN gave her the desire to learn more about her grandfather and his military experience. She brought much of her research and even a few papers and books from the war which she shared with us. I loved how much this novel affected her! UNBROKEN is an incredible survival story about an incredible man. Definitely recommended! I'm not sure why, but I too have been hesitant to read this. I'm still not sure I will. I have a feeling I'll like this one a lot. A non-reader friend of mine raves about it. I absolutely loved this book. I DO agree she could have written an entire separate book about his life after...how he has transformed his life into something extraordinary. But the entire story just captivated me, and even at times I teared up. The audio was excellent, and perhaps that helped me through the sections that were detailed, I don't know. It is just one of those books that makes you appreciate the true heroes and the strength of human spirit. How could anyone not love this book? UNBROKEN is not dull. It’s a can’t-put-it-down book that will keep you up at night. Do yourself a favor: don’t read the book flap or other reviews until you’ve read the book yourself. I didn’t think this was a depressing book. I’ll admit, sometimes it was hard to read, and, if you’re like me, you may get so caught up in the story you’ll even get a headache at times. I wanted to keep reading because, even though bad kept happening, Louie kept overcoming. Hillenbrand continues the story after Louie’s military service, and we see his (and others who were with him) ability and inability to cope. We see lives forever changed, often disastrously. And we also see . . . . Well, I can’t continue without giving away what you should read and not anticipate because of something I said. But hint: I learned some unpleasant facts about Japanese civilians during World War II and after, even to present day. Although I read slowly, I read a lot. I usually find one, maybe two, books a year that are so wonderful I can’t speak highly enough of them. This is one of those books. I've had other friends have a similar reaction...no worries...we all read books differently. It is a personal favorite of mine. Loved it from the first to the last word. I'm one of the ones who loved the book. I think everyone should read it if only because it really makes you appreciate what our veterans have been done for us. But I also agree with you that the ending was a bit rushed. Then again, all I really needed to know was that he was able to get on with a happy life, and to go into any more detail would have made the book even longer. Here is my review, if you are interested. This book has been sitting on my shelf forever; I really need to make time to read it. I'm not really interested in the details about the planes, but I am intrigued by the survival aspect of the story.